Review posted November 23, 2018. 360 Degrees, Wilton, CT, 2016. 16 pages. Wow! I’m not sure how long this book will hold up in the library, but it would be a wonderful book to own. 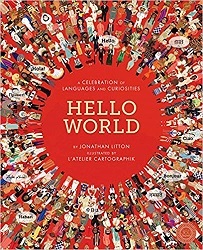 Mainly, this book consists of how to say Hello in many, many languages all over the world. The method used is large maps of the continents, with speech bubbles showing how to say “Hello” in different languages, pinpointed by location. The words are printed on flaps. When you lift the flap, you get a phonetic pronunciation and the number of speakers of that language in that country. Other language facts are listed throughout the book. The pages are made of sturdy cardboard, so it’s made to take some tough usage – but, well, lift-the-flap books in the library are generally doomed to suffer from overenthusiastic usage. Once enough flaps are ripped off, this book won’t be as useful. (Reserve it quickly, while our library’s copies are still new!) But this would be a book worth owning and poring over. I can imagine a child who enjoys highly detailed illustrations getting a lot of joy out of this book – at least as much joy as finding Waldo! And if you could then take that child to where some other languages are spoken, they would have an excited appreciation of being able to say Hello. This is a lovely idea, and it’s carried out beautifully. May the flaps endure through many, many check-outs!